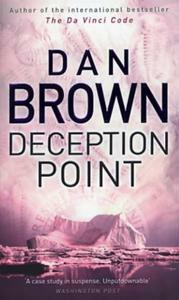 In the world of page-turning thrillers, Dan Brown holds a special place in the hearts of many of us. After his first book, Digital Fortress, almost passed me by, he wrote Angels and Demons, which was probably one of the half-dozen most exciting thrillers of last year. It is a pleasure to report that his new book lives up to his reputation as a writer whose research and talent make his stories exciting, believable, and just plain unputdownable. The time is now and President Zachary Herney is facing a very tough re-election. His opponent, Senator Sedgwick Sexton, is a powerful man with powerful friends and a mission: to reduce NASA’s spending and move space exploration into the private sector. He has numerous supporters, including many beyond the businesses who will profit from this because of the embarrassment of 1996, when the Clinton administration was informed by NASA that proof existed of life on other planets. That information turned out to be premature, if not incorrect. The embattled president is assured that a rare object buried deep in the Arctic ice will prove to have far-reaching implications on America’s space program. The find, however, needs to be verified. Enter Rachel Sexton, a gister for the National Reconnaissance Office. Gisters reduce complex reports into single-page briefs, and in this case the president needs that confirmation before he broadcasts to the nation, probably ensuring his re-election. It’s tricky because Rachel is the daughter of his opponent. Rachel is thrilled to be on the team travelling to the Arctic Circle. She is a realist about her father’s politics and has little respect for his stand on NASA, but Senator Sexton cannot help but have a problem with her involvement.